From my research on local communities and schools, I am planning to develop a new service which brings locally produced fruit and veg by children into supermarkets. The main aim of this service is to encourage children to learn more about food and where it comes from, as well as improve their diets. also, by displaying the fresh produce in the supermarkets, it will hopefully change peoples opinions, so they no longer feel that they are 'destroyers of urban and rural communities'. This service will be developed into a brand, to include a logo, packaging design and promotional items (posters, flyer's, adverts) that could be put up in schools and supermarkets to promote and encourage a healthier diet, and way of life. 5 out of 10 have a place to grow vegetables either at school or close by. I am very happy with these results, as it shows that children are interested in healthy food and eating. More of them than I thought are already involved with growing already, and it always helps when they enjoy eating what the grow! After taking into consideration the points raised, mainly about the health & safety issues surrounding selling the fruit and veg the schools have grown in the supermarkets, i decided to see what the quality requirements/ standards were. I contacted everybody from The Department for Environmental Food and Rural Affairs to a Horticultural Marketing inspector at the Rural Payments Agency who wernt as helpful as I would of liked. One piece of interesting information I did find out was that supermarkets all have their own individual standards. This is when I came across a really important scheme that Waitrose is involved in, called the Small Producers Charter. Who aim to sell locally produced food in the supermarkets. After researching the requirements in supplying locally produced food in Waitrose, I am confident that the children would be able to grow their own food (under supervision) and supply to the supermarkets under this scheme. Here is a diagram illustrating the start of my idea. I am really interested in the idea of children growing their own food, all kids love playing with mud and around in gardens. 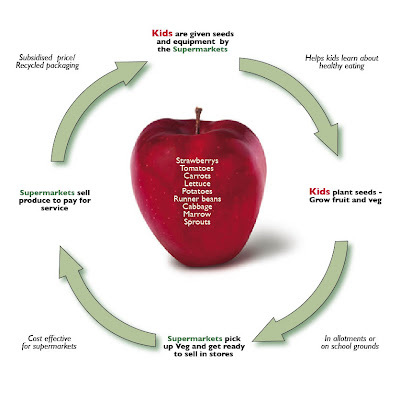 Although this is already something that the supermarkets back, I think that if they actually sold the produce that the children grow, it would be of greater benefit to the local community, and more incentive to the supermarkets to push the campaign further. This is the idea I want to explore further. I have contacted the organisation 'Learning outside the classroom' as they do a great deal of charity work with youths. I would like to find out the success of their programs, get some feedback on the idea, and hopefully some more contacts whose brains I can pick!! I have also requested some information from Morrisons about 'Lets Grow'. They seem a bit biased on the website, stating the project is hugely successful, I would like to find out if this is really the case. Getting kids on my side is a huge part of my project. I have got in contact with all the children I can, as well as parents, to find out about eating habits, whether they know how to grow fruit and veg, as well as to gain feedback on the idea of children growing their own food to sell. 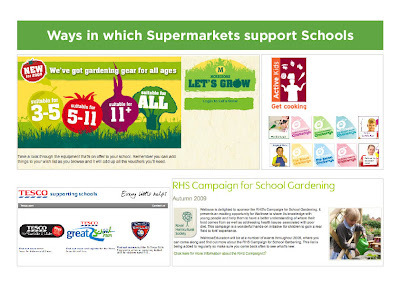 It seems that supermarkets already have a few schemes set up in order to support schools. I am going to try to contact them to find out how successful they are. It would also be helpful to get some feedback from schools and children, see what their views are, and whether they would be interested in participating. I have chosen to take one part of the local community - Schools, and map further. 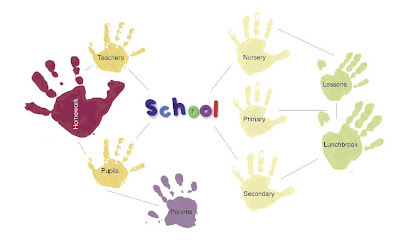 Schools are an integral part of any community, I am going to aim to see if I can get children, teachers and parents more involved with supermarkets or a service they provide.